Is your jewelry box filled with items passed down from family, and perhaps with pieces you no longer wear? 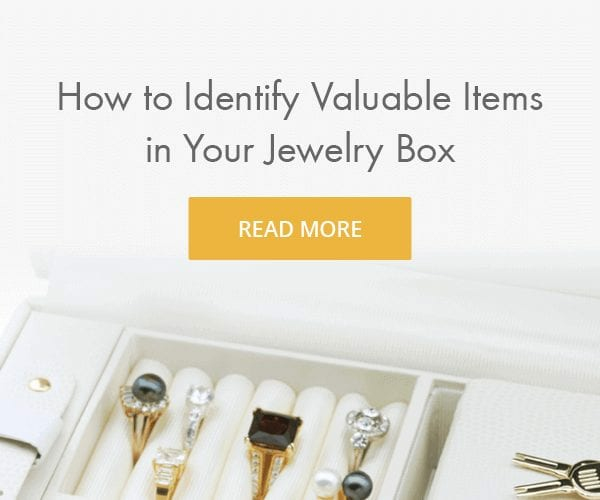 Whether you’re a collector or inheritor, the items in your jewelry box can be a treasure trove of surprises. Jewel-encrusted items we think may be extremely valuable can be worth only a few dollars; while something like a simple chain may be worth thousands. If you’ve ever scored a great deal for a shiny bauble at a flea market or found a lost ring, you probably know that feeling of excitement and curiosity. While the sentimental value of jewelry is priceless- how can you determine if that sparkly ring in your hand is a precious treasure, or a cheap trinket? These markings are usually located on the inside of a ring or bracelet, the post of an earring, or on the clasp of a necklace. If the piece is stamped, it will generally list the metal content of a piece, such as the gold karat purity. And if there are other markings present, may show a designer’s signature, manufacturer logo, or the country of origin. Unless the hallmarks have worn off from years of wear, all fine jewelry should have some type of stamp. Round cut stud earrings sold at auction for $2,484. Some collectible fine jewelry maker’s marks include Van Cleef & Arpels, Cartier, and Tiffany & Co. Items containing these stamps should be appraised for authenticity. There’re a multitude of maker’s marks and hallmarks; the fact that your jewelry is stamped, can help give clues to its identity and value. Cartier Love Bracelet sold at auction for $3,820. If the piece looks antique, is not stamped, and heavier than expected- it may be worth checking out. However if the item looks new but does not have any markings at all, it is likely costume jewelry. Identify the material: is it fine or costume? The value of gold or platinum is determined by the percentage content and weight, regardless of design. Any diamonds and semi-precious stones in the piece have a going market value. Most costume jewelry have insignificant value in materials, but subjective factors such as maker and age may create value in certain collector markets. 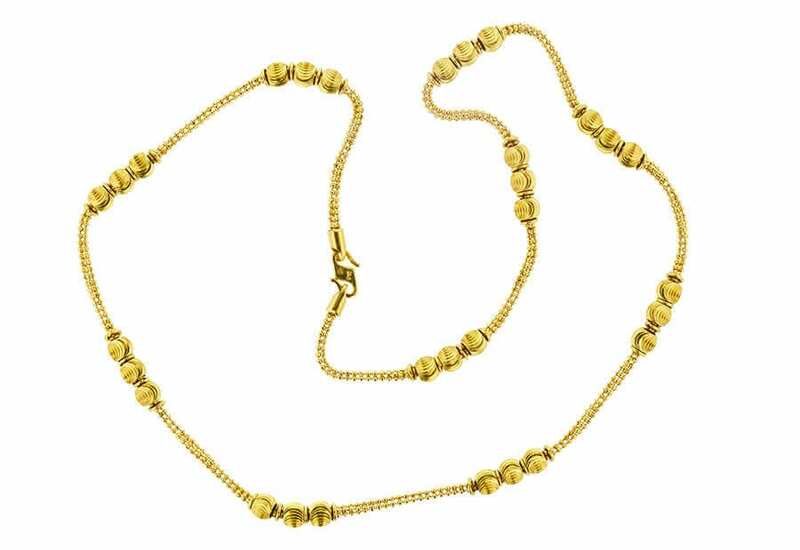 22K gold necklace sold at auction for $2,250. Metal Weight (g): 69.85. This is particularly important when you’re assessing items like chains and bangles. Generally gold and silver are heavier metals than non-precious metals like brass and pewter. For instance, if you have two similar looking gold chains with very different weights, one chain is likely fake or made of hollow gold links. Solid gold and platinum pieces have a significant heft to them. Platinum custom made GIA 0.71 CT round cut solitaire ring sold at auction for $1,319. Metal in costume pieces are usually a gold or silver colored plating over a (non-precious) base metal such as copper, aluminum or brass. If you see a darker or silvery color showing through parts of a gold chain that see heavy wear -and if parts of it are discolored or flaking off- this is likely a gold-plated chain. When solid gold or platinum jewelry wears down, the part showing through should still be consistent with the original color. This is not the case for white gold, which is usually rhodium plated to give it a whiter, brighter finish. Look closely at colorless gems. Modern diamond cuts are very precise but older cuts can be less symmetrical and defined. As for colored gemstones such as rubies, sapphires and emeralds; antique gems are often untreated, making them more sought after. Keep an eye out for stones with good transparency, and strong, bright colors. 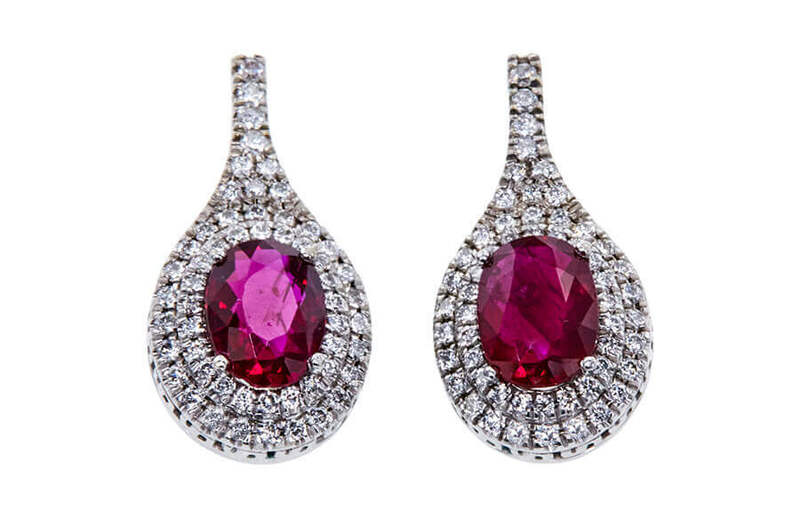 Ruby earrings sold at auction for $1,263. Additionally it’s a good idea to check how the gemstones are set. Are they glued onto the piece, or held in place by an intricate setting? Fine jewelry is well-crafted, with each stone clad by prongs, bezel, tension, or channel set mountings. Look inside and at the back, the best jewelry should have an excellent finish on all surfaces of the piece. Round cut diamond tennis bracelet with prong setting, sold at auction for $2,872. Some higher quality costume jewelry uses prongs just like fine jewelry. That’s when weight, hallmarks, and examining the finish, can help shed some light on the identity of a jewel. While your jewelry box may be filled with heirloom pieces which are cherished and passed down; it is also likely to contain pieces not to your taste. Jewelry fads go in and out of style. Just because they’re not fashionable now, doesn’t mean they’re not valuable. When in doubt about the authenticity and value of any jewelry items, it is best to have a professional gemologist evaluate and thoroughly look them over. You may just be amazed by the treasures you never knew you had. Originally from Singapore, Yingjia Puk has always loved crystals and minerals. She began her career in the fashion industry in 2006, working extensively with jewelry as an editor. That journey led her to a gem-buying and production position with a prominent celebrity jeweler, where Yingjia sourced for rare and unusual gemstones for unique one-of-a-kind pieces. Her combined experiences led her to understand the intricacies of fine workmanship, and the importance of providing fair value to consumers in both retail and resale environments. Yingjia is a GIA certified graduate gemologist and holds a BA from New York University. Moissanite vs Diamond: What’s the Difference?